This one has my attention. I'm eager to read it. Thanks for the excerpt! YES! Good! I hope you enjoy it if/when you read it, Sophia! Ooh, I love this swoon! 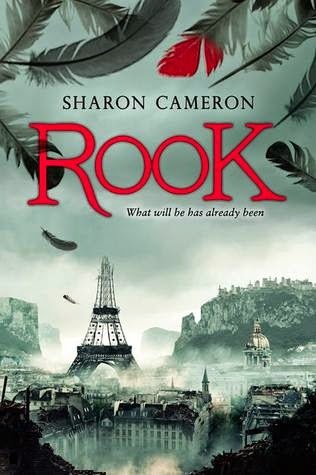 I haven't read any of Sharon Cameron's books but I am pretty excited to read Rook :) Thanks for sharing! YAY! This makes me so happy! I hope you love the book when you read it, Aimee! Oh my what a hot swoon, rattling the shelves. That is some kinda kiss. Oooooh, what a swoon!! Makes me want to read this one even more now!! I feel like the biggest dork for not putting two and two together- that Sharon wrote this AND the Dark Unwinding books. SIGH. I just saw her a couple months ago too! Rofl. Wow! Slow and sweet to begin with, then hot and heavy. Got to love those kinds of swoons. Thanks for sharing. Hope you have a great weekend, Alyssa. Right?! A favorite type of swoon. Arg, I've been hearing a lot of good things about this! This teaser definitely has me excited to check it out! Love romance, haha. HA! Inflating your TBR, one book at a time. I hope you read this one, Cyn! That kiss is certainly heating up!